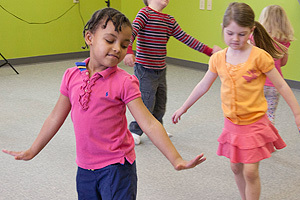 Nancy McMillan has been teaching piano since 1991 and the Musikgarten program since 2009. She is a Certfied and Licensed Musikgarten Instructor. For the past four years, she has been awarded the Musikgarten Achievement Award, which signifies that Nancy attained certification in all Musikgarten levels for children ages birth to nine. She received her B.A. in Music from Western Connecticut State University and her M.A. in Music Performance and History from Lesley University. Her performing experience includes lecture-recitals on women composer/pianists; performing in the Rags to Riches Duo; and various accompanist positions. In 2003, she was a recipient of the Jane and Michael Sendzimir Scholarship for women musicians. Her program entitled “Four 20th Century Women Composers” was broadcast over WMNR in Monroe, Connecticut. Nancy is co-author and co-performer, with Gretchen Trapp, of the chamber-theatre piece “Clara Schumann: A Passionate Spirit”, which was presented at Naugatuck Valley Technical and Community College in the spring of 2003. Nancy's compositions include music for solo piano, voice, and musical drama. In 2002, she was a finalist in the Robert J. Pickering Award for Playwriting Excellence, for music written for “Magic by Moonlight” (book and lyrics by Jan Dow). 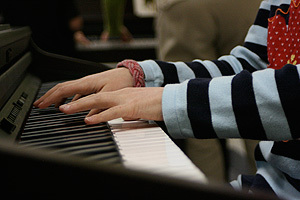 Nancy offers Musikgarten classes and private piano lessons to all ages.